This house was a landmark in Hudson Center for many years; standing at Kimball Hill Road opposite the Hudson Center Common and directly across from the front steps of the Baptist Church. The first occupant was Dr. Paul Tenny who moved to town about 1791 and later settled here. The property was sold to Dr James Emery in 1849. When Dr. Emery retired it was purchased by Henry C. Brown; in 1935 it was purchased by John T. Benson and became part of the Benson’s Wild Animal Farm property. 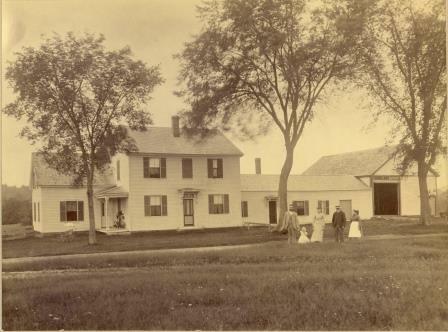 Vera Lovejoy and her family lived here while she was managing the Benson Farm. This c1895 photo shows, left to right, Henry C. Brown; Ina Louise Brown, daughter; Clara Bryant Brown, his wife; and John and Eliza Brown the adoptive parents of Henry. Photo from the Historical Society Collection. By Ruth M Parker in Center on February 19, 2015 .